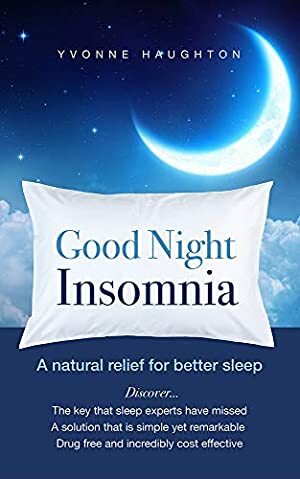 Good Night Insomnia: A natural relief for better sleep: A Simple, Unknown, Low-Cost & Drug-Free Solution for Chronic Sleeplessness | Sleep Well, Stress Proof Your Life! Ideally, a person should spend a third of his entire life sleeping. This becomes essential to maintaining right energy levels, staying focused at work, achieving success in life - staying happy and productive, nurturing one's relationships and performing each and every action that will bring vitality into one's life, making it all the more meaningful and beautiful. However, do you feel that you are not among those lucky individuals who are able to catch up with those blessed hours of sleep? Has the place you associate with rest after a long, hectic day become a symbol of fear and anxiety for you? Do you spend most of your time on your bed, twisting and turning, while feeling miserable? Are you fed up of all the common and not so common solutions that only result in more frustration? If your answers to the questions above AFFIRM your current state, then this book is for you! Good Night Insomnia narrates the personal journey of Yvonne Haughton (a retired fitness trainer, based in the UK) who fought and overcame the tyranny of insomnia. Having spent over 40 years as a victim of sleeplessness, Yvonne talks about how she felt at different phases of her life and at one point even contemplated suicide. Her personal experiences, frustrations and restlessness for solutions were such that every reader will be able to connect with them. A quick read, running through just 38 pages, Good Night Insomnia explains the one solution that finally worked for Yvonne and gave her peace of mind. The solution of insomnia that Yvonne has reached is something that is not just simple, but remarkable too. In fact, even doctors and experts have somehow missed this point - which is why no one talks about it. The solution is a result of 40 years of pain and suffering Yvonne went through, which finally opened up a path for her. The book is an attempt to tell the world and all those who are suffering with the insomnia epidemic that they can gain back control of their life too. One of the features that differentiate this book from the rest is that the solution is a result of personal experimentation and not something that one could find in books and magazines, titled as "Common Remedies for Insomnia." With no gimmicks, tricks or buying-baits, Good Night Insomnia lucidly discusses an unknown way to fight lack of sleep that will help you own your mornings, just like Yvonne is able to, without wasting 40 years of life grappling for a solution. Log In to track Yvonne Haughton on eReaderIQ. to be notified each time the price drops on any book by Yvonne Haughton. to stop tracking Yvonne Haughton. The current price of this book is £3.99 last checked 21 hours ago. We last verified the price of this book about 21 hours ago. At that time, the price was £3.99. This price is subject to change. The price displayed on the Amazon.co.uk website at the time of purchase is the price you will pay for this book. Please confirm the price before making any purchases.